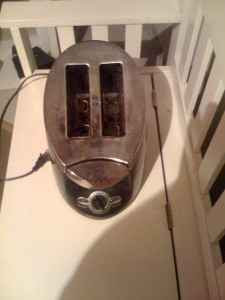 I saw your ad on craigslist for the toaster for sale http://toronto.en.craigslist.ca/mss/hsh/1169675958.html . Obviously when I saw it I became very excited, a toaster like that could easily go for 20-25% more than your asking price. Then I thought "is this too good to be true?". Maybe so. Could you please toast a few slices of bread in the toaster and then send me a couple of photos of the toast so that I know it works? PS: Do NOT just photoshop deep rich golden brown colouring onto a photo of un-toasted bread. I will know.